Fans of the Internet love to mock print magazines. They love to gloat and preen as the gate to Big Media’s kingdom has been thrown open — and the gatekeepers are torn from their thrones and tossed in the moat (the pockets of their blazers stuffed with rocks). We watch from a distance as the city burns to the ground. Like there is nothing redeemable about these institutions. That’s unfortunate. Because they actually have a lot to teach us. There’s no doubt the Internet is a beautiful thing. It allows all of us to have a voice — through a blog, a Tumblr, a Facebook profile, an Instagram portfolio, YouTube channel, or a curated email newsletter. Unfortunately, when everyone has a voice, no one has a voice. It’s a strange way to find yourself in obscurity. And let’s not forget the surge of content as more businesses become media publishers. Some might call this surge content shock. Others, abundance. Call it what you want, but you have to understand that we’ve always been under the crushing weight of information overload. Of course, some of this content is good, but most of it is bad. Or dull. But there is also great content. Powerful media that emerges and shows up everywhere — for a long time. And it doesn’t matter if we are infested with a plague of blog posts, podcasts, and videos. But what does that content look like? And how can you create it? Fortunately, Google told us how it could look. In very specific language — 23 thought-provoking questions. So there is no need to read the tea leaves. Would you expect to see this article in a printed magazine, encyclopedia, or book? We’ve all got our favorite magazines. But getting published in them is almost impossible, which is why we celebrate and embrace the Internet. See, the Internet allows us to publish content that might never see the light of day in print. But Google advises that we do not spray the web with shallow, substandard work. Maybe the print magazine gatekeepers were onto something. Which is why Google essentially recommends that you publish work online with the qualitative content standards of a publication such as The New Yorker. 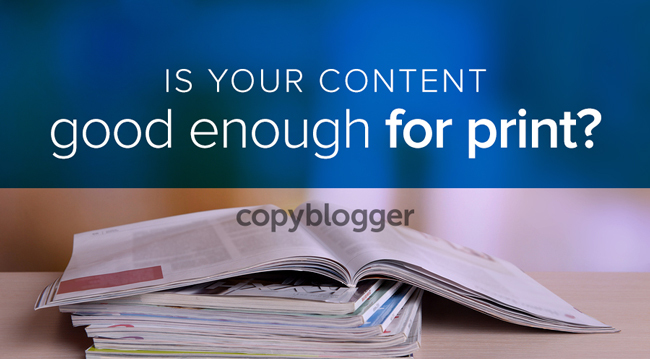 What do top print publications look for? What does great content look like to them? Here are 10 vital lessons we can learn from the print world. Magazines want originality. This is one of the reasons they covet writers who present new discoveries. And this is one reason why they prize writers, like Malcolm Gladwell, who popularize these new discoveries. You don’t have to be a scientist to pull this off. You can interview people, run a split-test, dig through archives, or poll an audience. But just any old discovery won’t do. And keep in mind: They aren’t handing out Pulitzer’s for blog posts. Yet. If your discovery doesn’t move our understanding of a topic at least a hair’s breadth, then it’s not original. Teach us something new. Or something we couldn’t figure out in a few seconds with a pencil and piece of scrap paper. In other words: Avoid the self-evident. Writers often make the mistake of quoting statistics that have become clichés. Like the number of blog posts published every day … that’s a favorite stat used by lazy writers. Especially in openings. It turns the reader cold. Keep digging to find something that isn’t obvious. This one you can fudge on, because even great journalists weren’t afraid to inject their personalities and opinions into their content. Think Joan Didion and Hunter S. Thompson. Besides, a blog post is a perfect vehicle for a rant. We may even select our favorite writers based upon the personality and flair they infuse in their writing. We like the angle they take when approaching a subject. We like that they tackle issues with unconventional methods. Or perhaps we just dig their dysfunctions. Great content is born when you take a topic and tease apart the nuances. It’s like dissecting an animal. Show us the meat of the article, how it’s connected to other arguments, and where these conclusions could lead. What’s important, however, is that you are an expert on the subject matter. If you’re not an expert, your analysis may be naive and flat-out wrong. Most people don’t know the difference between a summary and a commentary. A summary is a recap of a piece of work or an event. Sports radio announcers give summaries during the game. Post-show analysts give commentary. They explain why something happened. They dig deep and explore theories and offer interpretations. A commentary is full of judgment, perspective, and opinion. It also includes a personal reaction to an event, usually an emotional response. And it delivers a not-so-obvious interpretation. For example, you see commentary in content when writers dissect a statement Matt Cutts made or explain the latest big news event. Award-winning writer Adam Skolnick wrote a New York Times article about the death of a free diver, which was an Internet sensation. Soon, a book deal followed. Fact is often more interesting than fiction. But the difference between your story and a Pulitzer-caliber one is the depth. The characters are unpredictable, but lovable. The plot is a hotbed of conflict, uncertainty, and tension. And the conclusion takes us by surprise. So, keep an eye out for stories — remarkable nonfiction stories you can tell your audience, as well as engaging stories you can use to open your articles, and pertinent stories you can use to support your ideas. Print magazines have a low tolerance for shoddy stories built upon shoddy facts. This is why they will go through rounds of fact-checking before publishing a story. Even if it means pushing the publication date back so the writer can buttress her facts. The Internet, on the other hand, has gone soft on fact. We love a good hoax. And we seem not to care so much when we are duped. But here’s the thing: Gross errors kill credibility. Check, double-check, and triple-check your sources. And if you have any doubt about a fact or story, skip it. Shove examples, facts, numbers, reports, and charts into your articles. And make ’em specific. Don’t just tell me an African elephant weighs a lot. Tell me it weighs 5,291 to 7,716 pounds. Its trunk alone weighs 330 to 440 pounds. And its brain? Eleven pounds. More than a newborn human baby. Those figures attract attention and activate a reader’s imagination. Specific details are captivating and help you build believability. Why should you be the one writing this article? How many years do you have in the industry? Do you have the right education, experience, and connections? Fortunately, authority is something you can develop. As you build it, expect your writing to get more attention. Call it unfair, but your opportunity to write for a major magazine could be killed with just one misspelled word or dangling participle. But you shouldn’t be surprised that magazine editors who are inundated with pitches seize the slightest opportunity to reject you. The same could be said about Google. Long ago, Matt Cutts suggested there was a relationship between poor spelling and low search rankings. Bing’s outlook is similar. If you have to, pay someone to polish your articles. Remove the errors. You won’t create the perfect blog post, video, infographic, or podcast episode the first time around. Nor the second. Or even the third. More likely, it will happen around number 100. But don’t let that discourage you. Keep producing, and enjoy the journey. As I mentioned in my Copyblogger post last week, that’s the most important part about creating content: Remain a great lover of the experience as you master the craft. And who knows, you might even catch the eye of your favorite famous magazine along the way. Do you have any tips from the print publishing world to add to this list?